A LIVE sheep export transparency initiative launched yesterday to promote trust in the trade has been branded a PR stunt and “desperate industry propaganda” by RSPCA Australia. Australia’s biggest sheep buyer and former exporter Emanuel Exports yesterday launched The Sheep Collective as a coalition of leading WA sheep producers, transport and feedlot operators, exporters and importers to provide transparent information about the trade. The collective’s launch coincided with a tour of the live export vessel the Al Shuwaikh in Fremantle for MPs and Sheep Producers Australia representatives, as it loaded about 71,000 sheep and 312 cattle for the Middle East. 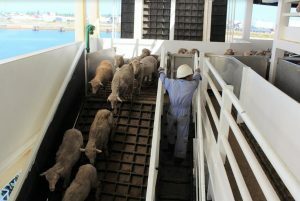 The Al Shuwaikh vessel is owned and operated by Middle East importer Kuwait Livestock Transport and Trading which imports between 1.2 – 1.5 million sheep from Australian each year. The exporter of the latest Alk Shuwaikh consignment, RETWA, is a wholly-owned KLTT subsidiary and has welcomed the initiative. It is also supported by the West Australian Livestock Export Association. Emanuel Exports and its subsidiary EMS Rural Exports had their export licences cancelled last year after the release of footage showing dead and dying sheep on Middle East shipments. The sparked public outrage, industry reviews and reforms, and numerous political efforts to phase out the trade. Emanuel Exports managing director Nicholas Daws said the tour was important for key decision makers and suppliers to better understand the trade. “We want to be more open, and for the community to understand the valuable contribution sheep producers and exporters combined make not just to Western Australia agriculture, but to providing protein and food security to our valued trading partners. “I’m convinced this trade can be done in a sustainable way with good animal welfare at the forefront,” he said. Sheep on the Al Shuwaikh. Emanuel Exports said it had drawn together The Sheep Collective as part of a wider transparency project being run by the company which also includes tours of export vessels by state and federal MPs, industry partners and producers. The company said ensuring the health and welfare of our sheep is at the core of everything done by The Sheep Collective, across the supply chain, every day, every year. Others involved in and passionate about the livestock export trade have been invited to be part of The Sheep Collective, to help share their story. 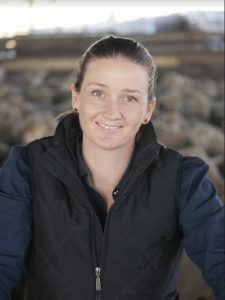 WA sheep farmer Bindi Murray said farmers spend their entire lives dedicated to breeding and raising happy and contented animals and having the Australian community better understand this is really the cornerstone of The Sheep Collective initiative. Rural and Livestock Transporters Association president Andy Jacob said livestock transport drivers often come from a farming background, so have a lifetime of experience handling and looking after animals. “You need to be a stockman first and a truck driver second, that’s what is important to us. “Animal welfare is paramount,” he said. However, RSPCA Australia’s senior policy officer Dr Jed Goodfellow, it should not be forgotten that Emanuel Exports licence has been cancelled and the company is under investigation for historic breaches of animal welfare standards. “If the live export industry wants people to believe they’re serious about animal welfare, then Emanuel Exports should have absolutely no voice in this discussion. “We don’t need this desperate industry propaganda to show us what conditions look like in live exports,” he said. “This is nothing more than a PR stunt by a desperate and disgraced ex-live exporter and their associates. Dr Goodfellow said the RSPCA’s offer last April, to travel on board a live export journey, has never been accepted – and still stands. “If the industry wants to be transparent, that’s what real transparency looks like. “This latest PR campaign changes nothing – the live sheep export industry’s problem is that opposition to their practice is based on robust science and evidence, not heavily-edited corporate videos and industry spin,” he said. He said it was time for the sector to accept that its model was based on suffering and start working toward its transition. Emanuels Exports’ new corporate governance and compliance officer, an accredited veterinarian Dr Holly Ludeman said livestock export is not glamorous. “It can be dirty, dusty and smelly, but it’s not cruel. “There’s a lot of care and effort that goes onto taking care of livestock throughout the supply chain, and I think it is important that people understand and see this first-hand,” she said. “Livestock export provides a valuable protein and food source to our trading partners, and we want to show this can be done well with good processes and animal care at the forefront of everything we do,” Dr Ludeman said. 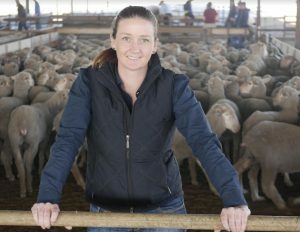 “Emanuel Exports recognises more needs to be done to improve transparency and trust, The Sheep Collective will demonstrate the care that is involved in all parts of the supply chain, I’m proud to be part of it,” she said. Although the industry is now moving to a new heat stress assessment model for shipments, Emanuel said the Al Shuwaikh’s last voyage undertaken by KLTT to the Arabian Gulf recorded a 0.3 percent mortality rate among the 69,917 sheep loaded and no cattle losses. KLTT said it has invested over US$500m into its supply chain infrastructure, including recent major items such as a new vessel under construction for US$100m and new state of the art processing facility in Kuwait City. Click here to see The Sheep Collective partners video. Emanuel Exports claiming transparency – really? If the company is now transparent, as they claim, why aren’t the media or RSPCA allowed on a journey? Presenting acceptable appearing conditions easy to do in a pre-arranged tour. The real test of transparency is allowing truly independent observers such as RSPCA and media to embark on journeys. The export company has refused to allow this. That refusal speaks louder about their level of transparency; louder than any number of pre-planned tours. Ridiculous. Past statistics and on board reports tell everything we need to know about Emanuel Exports attitude to and record with live animal exports, and this whitewash won’t fool anyone except those who want to hope against all hope, that the trade can be carried out humanely without any risk or suffering. Fazal’s footage taken over five voyages is a visual representation of what the figures tell us. Emanuel Exports has been responsible for tens of thousands of supposedly fit-to-load sheep aboard its ships, and for every sheep who died of heat stress, there was another one, two or ten who suffered. It matters not whether it was paid for or not – almost identical conditions have been filmed by government-paid “independent” observers and that footage is also backed up by (heavily redacted) reports. This is a dead trade walking and amount of industry spin or smoke and mirrors will change that fact.